The annual family carnival returns with a huge mix of your favourite rides, carnival food and fun of sideshow alley! Located at the beautiful parklands at the foot of the Coffs Harbour Jetty. Coffs Jetty is an alcohol free zone. 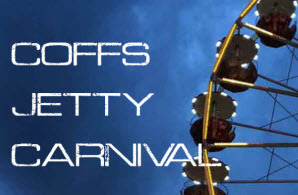 Enjoy the sounds, lights and atmosphere of summer, this summer at the Jetty Carnival. Online tickets are non-refundable but are able to be used any night until 20 January 2019. Event Notes:Please print your ticket/s and present at the Dodgem Car ticket box to exchange for your ride coupons.